Are you saying that a literal 'temple' must be built before the coming of Christ? That's right; Daniel 9:27, 12:11, Matthew 24:15, Mark 13:14, 2 Thessalonians 2:4 are evidences that the temple must again be rebuilt in days to come. Of course, this is not all; throughout the entire Bible there is great anticipation regarding Israel's future glory in her land following a terrible time of devastation. The temple, while not in the least sanctioned by God, is a statement of Jewish pride and rebellion against God, which antichrist will use to deceive and destroy Israel in the days immediately prior to the second coming. So while I believe a literal temple is yet to be built, I am not saying that this is a good thing in and of itself, except that it is one more step towards the coming of our Lord Jesus Christ. Just found your blog on here from Sermon Index and wanted to drop you a hello! Let me know if you ever make your way over to North Carolina to do some ministry. Maybe we can partner together to do some outreach. Timothy, I gather you reject the Rapture teaching? You have to define "rapture", because I certainly believe in the "rapture" (harpazo, 1 Thess. 4:17) but not in the pretribulational sense, which is what I gather you meant in your question. The rapture, or the catching up of the saints, takes place when Jesus Christ returns to earth. I believe in one final coming of Christ, not two, or a secret one, or a partial one, but a full and final revelation of Jesus at the end of the age. This, I firmly believe, is the definitive teaching of Scripture. So I do believe in the rapture in its Biblical context. Here is my question: if the Jews were to build this false temple in defiance to Christ's teaching that "the time would come when men would no longer gather in the temple", and that Christ is the true Temple, how is it that Daniel says, "when you see the abomination... standing in the temple of God"? In what way would this temple be a temple of God more than a Buddhist temple? Is it simply because it is dedicated to the true God in the wrong way? Oops, I meant "Grafted Kingdom Theology"... the link still works. update us on your labor in Utah, brother! I'm itching to hear how things are going. AMEN! Eli: on Israel and the second coming of Jesus Christ. As Christians, we are not going to escape out of here so easy; but God will be with us. He will take us through to victory in him. Ephesians 6:10 Finally, brethren, be strong in the Lord, and in the power of his might. Hi Eli, I can see that as a true disciple of the Word you've come to see "Prophecy" in it's true light.Only Holy Spirit can reveal the "things to come",we would do well to heed Him,the confusion and foolishness,not to mention the irrationality of so much prophetic speculation is the result of neglect of the study of God'sWord.You've hit bull's eye.Amen.Keep up the good work.Dad. 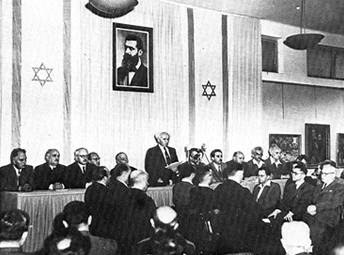 if God truly regathered Israel in 1948, then how come only jews came? It will not be a false temple, just built because of faulty theology. Yisrael in part is in rebellion and unbelief to this day living under a secular Socialist/Marxist government. The Godly Jews are preparing to build the temple even now. Type Temple Mount Faithful in a google search and you can see their progress. Priests in training for years. Sanhederin council reborn in 2005 after 1900 years. Passover lamb sacrificed last year at foot of temple mount. Anti Messiah will stop the sacrifices in a single act of Blasphemy and claim rulership over all. Many translations claim he will claim to be GOD / ELOAH >> (Abomination of Desolation) 2 Thessalonians 2. When the Apostle John wrote down the Revelation of Jesus Christ the future endtime temple is being measured and by the time this book was written, the old literal temple had been burnt, destroyed and leveled approx. 20 years earlier and remains in that condition to this very day. A literal temple is coming soon. The religous Jews teach a temple for all nations will stand in that spot, so that is what they are working towards. Totally sincere but sincerely wrong. It is called the Temple in Rev. chapter 11 and described with an inner court for the Jews and an outer court for the non Jews. Jerusalem is soon to be divided by the world powers and then the temple mount and the literal temple courts will be shared for a short time. mayeeden...you said "The Godly Jews are preparing to build the temple even now." If they are godly, they wouldn't be preparing a temple. They would be worshiping Jesus and understanding that there is no need of a temple. Are you saying that the second re-gathering God does in UNBELIEF and then they will be scattered again and a THIRD TIME a re-gathering is done in BELIEF after they repent? Or is the great tribulation judgement on the whole world and then God re=gathers Israel at His second coming IN BELIEF the SECOND TIME for the 1000 year reign? I am just looking for the truth, thank you...Can you give me the scriptures of God re-gathering the house of Israel IN UNBELIEF according to this scripture they will have the New Covenant at the same time.. It simply depends on your perspective of what constitutes a regathering. If by regathering you are thinking simply of all the times God brought Israel back to the land, then yes, I believe the regathering of Israel in 1948 is the second regathering, and the final regathering at the coming of Christ would be the third. The first, of course, would be the regathering of Israel after the Babylonian captivity. "Then it will happen on that day that the Lord Will again recover the second time with His hand The remnant of His people, who will remain, From Assyria, Egypt, Pathros, Cush, Elam, Shinar, Hamath, And from the islands  of the sea. And He will lift up a standard for the nations And assemble the banished ones of Israel, And will gather the dispersed of Judah From the four corners of the earth." This verse is clearly referring to the final regathering of Israel at the end of the age, when they return to the land in covenantal blessing (just see the context). Yet God says this will be the "second time". How so? I believe the answer is in the detail that God will regather Israel a second time "from the four corners of the earth", or from all the nations of the world, those near and those far ("and from the islands of the sea"). The first regathering of this nature was 1948, and the second regathering of this nature will be the final regathering. The regathering of Israel after the Babylonian captivity was not from the four corners of the earth. The Israelites were in captivity only east of the Euphrates in the lands of the Babylonians, Assyrians and Persians. That's how I understand these prophecies. Israel will not be divided. What of Ezekiel's temple and the earth quake that will destroy the abomination that sits on the Temple Mount when Christ's feet meet the earth in the Garden of Gethsemane. There is nothing in the New Testament about a temple being built. Only the temple being destroyed. I understand the rebuilding of the temple to be a prophetic necessity, based upon the prophecies of the abomination of desolation spoken of by Daniel (chapters 9 and 11), which Jesus explicitly pointed us to. Jesus said "When you see the abomination of desolation standing in the holy place" (Matt. 24:15), which I believe we have not yet seen, and requires the rebuilding of the temple in Jerusalem. Paul says the same thing in 2 Thessalonians 2, explicitly stating that the man of sin will declare himself God "in the temple of God." Also, consider that Revelation 11 begins with an angel being commanded to measure the temple in Jerusalem in preparation for its being given to the Gentiles for "forty-two months". I understand these are contested verses, but we should not be so quick to say that the NT indicates nothing about a rebuilt, end of days, temple. There is a belief that an Antichrist, a supernatural being, a Devil will build a temple in Jerusalem and the world or at least the Catholic system will rise up against him. The one in Jerusalem building a third temple is not the Antichrist but Jesus Christ Himself as he would have returned to claim his bride and judge his household. When Jesus Christ' feet touch the Mt of Olives there will be a mighty earthquake (as the African fault line runs under Jerusalem), Mt Zion shall rise up, changing the topography as the temple will be built on Mt Zion, (Ezekiel's temple) the present temple site is Mt Moriah. The Kingdom of God will be established on the earth.